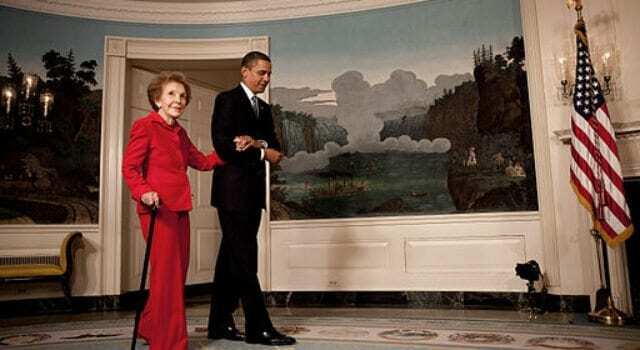 Despite noting Nancy Reagan’s “strength” and “charm,” the former First Lady apparently doesn’t warrant an in-person visit from President Obama at her funeral. Reagan passed away this weekend at the age of 94. Instead of attending her funeral, Obama is sticking to his scheduled visit to the South by SouthWest (SXSW) music festival. A White House official confirmed this afternoon that President Barack Obama will not be in attendance at former First Lady Nancy Reagan’s funeral on Friday. Obama will be represented at the Ronald Reagan Presidential Library by his wife, Michelle. Democratic presidential candidate Hillary Clinton said she will be attending the service in Simi Valley, California, as well. The president is scheduled to deliver a speech on Friday at the South by Southwest conference in Austin, Texas. Reagan’s funeral will be held on Friday at 11 am. The SXSW music festival extends from the 11th to March 20th, a nine day time frame. There was no way to shuffle that schedule around so Obama could attend the funeral and the festival? See the Tweets and read the rest of the article by Rusty at MentalRecession. Click here to see a little reminder of funerals Obama didn’t care much about either.